FAR recently held a two-day medical training on emergency pediatrics in Vanadzor as part of our overall healthcare initiative to ensure better medical services throughout all regions of Armenia. Held November 6th and 7th, the training was the result of a partnership with the Pediatric Intensive Care Unit of Virginia Commonwealth University, and it convened a variety of healthcare providers, including pediatricians, emergency and intensive care doctors, from Armenia’s Lori Province to get the most updated know-how on the topic. “Shock is shock. It doesn’t matter which country you represent. Through my presentation, I want healthcare specialists to be able to recognize the early signs of shock and to treat patients right away,” said Dr. Hooshang Semnani, Clinical Assistant Professor of Pediatrics at UCLA Medical Center whose lecture Pediatric Shock Among Children: Respiratory Disturbances; Clinical Cases, was the first of five topics that he presented during the training. His two colleagues Dr. Joseph Krikorian, Emergency Medicine Specialist from Code 3 Life Inc., and Dr. Shant Shekherdimian, Pediatric Surgeon from UCLA Medical Center, also discussed various topics. This series of trainings was initiated several years ago by Dr. Alin Baghdasaryan of Virginia Commonwealth University who, after conducting a needs assessment of emergency medical services in Armenia, concluded that training emergency-related specialists would be crucial to improve poor conditions. FAR has been the co-organizer for the last two trainings with Virginia Commonwealth, and we became the primary organizer just last year. 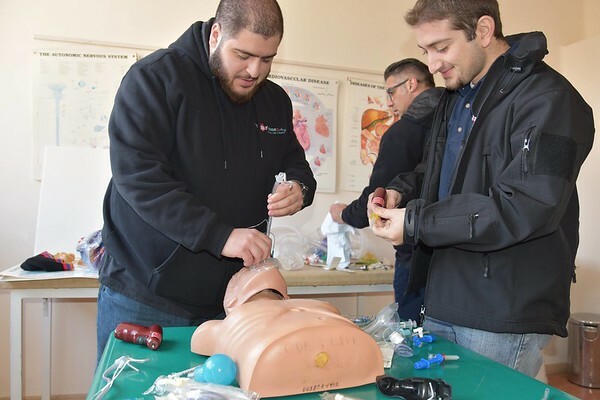 In 2016, 30 healthcare providers from Shirak Province were also trained in emergency medicine. This year, 31 from Lori Province attended. FAR’s healthcare team plans at least two more such trainings for healthcare specialists in Nagorno-Karabakh and Tavush Province.